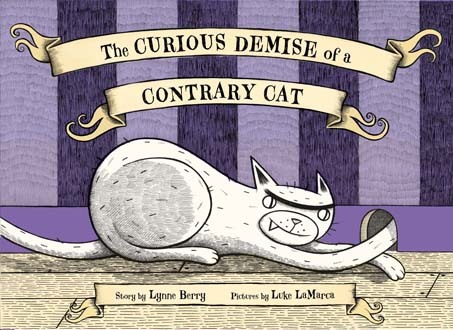 The illustrations in this wacky story are gorgeous pen and ink drawings, giving it a sort of period feeling that I personally think helps any spooky story. This one never specifically mentions Halloween, but I think it fits in perfectly with this month’s stories. My mother can attest to the fact that Margaret Wise Brown’s Goodnight Moon was my go-to bedtime story all through childhood. We read that book to death. So the idea of parodying such a beloved, seminal book for something like Halloween struck me as a dangerous idea. But I actually really liked this one, somewhat removed from its inspiration in my mind. All the elements are there, a little creature saying goodnight to every single thing in its room. But instead of a bunny, here we have a little monster saying goodnight to all the creepy things around it (like skulls and goo). And I think this book succeeds as a silly Halloween tale that takes the scary out of all the creepy things in it. It isn’t soothing like the original story, but little munchkins familiar with the original would find this a fun transition into something a little creepier. Creepier, but somehow not scarier. I think that’s hard to achieve, and this one works. This is one of the older books on this list, but I’ve just discovered it and kind of love it. 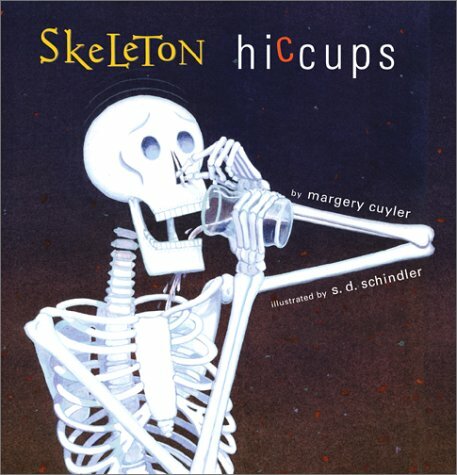 What happens when a skeleton has the hiccups? Hijinks ensue, that’s what. His bones fall apart whenever he tries doing everyday things (brushing his teeth, carving a pumpkin, playing with his friends). He tries to eat sugar and drink water upside down with creepy fun results (water pours from his eye sockets). It isn’t until his friend Ghost holds a mirror up to Skeleton that the hiccups are scared out of him. I think this is a funny, silly Halloween story (even though Halloween is never actually mentioned). It’s definitely got a bit of twisted humor, which I love. And whoever thought up Skeleton’s fuzzy bat slippers is genius. Oh No, Not Ghosts! 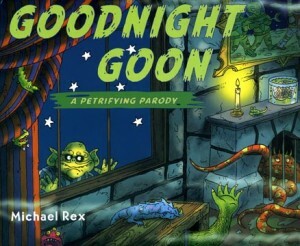 by Richard Mitchelson, illustrated by Adam McCauley (2006). 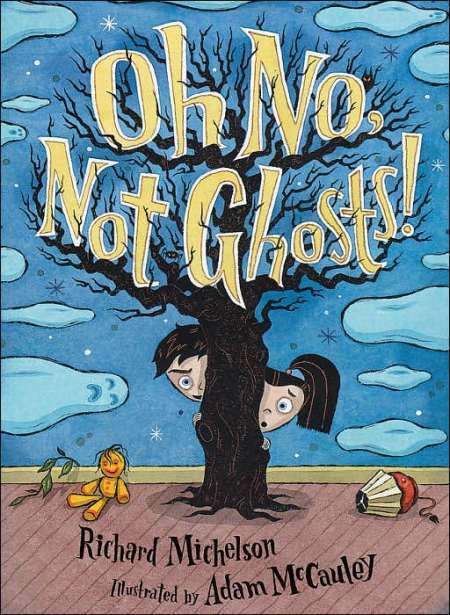 Like most of the other books on this list, Mitchelson’s spooky story isn’t specifically about Halloween. But honestly, books that beat you over the head with a message of “It’s Halloween!” can get tiresome really quickly. Instead, this is a story for every little sister who has ever been tormented by an older brother taking great delight in scaring the pants off her (I’m looking at you, Bobby!). My big brother Bobby and my older cousin Mike used to lure me into the abandoned chicken coop at the back of our grandparents’ farm (complete with dangling tools of death hanging from every surface) and regale me with stories of the chickens that still haunt it to this day. I don’t think I ever slept through the night at our Nana’s house. The hazards of being the youngest in the family by 7 years. Anyway, here Big Brother and his sister are left alone to keep quiet while their dad takes a nap. The brother pretends to reassure his little sister that there is nothing scary in the shadows and wind at night, certainly nothing scary like ghosts or giants or other monsters (wink, wink). As she gets increasingly terrified (and loud), his mischievous grin grows and grows until Dad comes to the rescue. This is a fun one for anyone who has ever been the tormented (or tormentor). 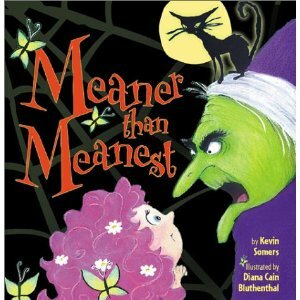 Meaner than Meanest by Kevin Somers, illustrated by Diana Cain Blumenthal (2001). This one is actually out of print now, but if you can find it at your library it’s great for some laughs. Here is an evil old hag who is the 2nd meanest creature alive (her cat Hiss is the 1st) who wants nothing more than to make the meanest, grossest creature in the history of the world for Halloween. She has all the right ingredients (frog sweat, scorpions, sticky spiders) and sets to work making a disgusting concoction that is sure to produce something truly hideous. But at the last second she realizes she has forgotten the eye of newt. This completely ruins her potion, and instead of creating a monster she creates the sweetest, most doe-eyed little girl with curls you have ever seen. (And this is truly horrifying to the old hag). The witch tries her hardest to turn adorable little Daisy mean, but nothing works. She befriends rats in the basement, makes friends with Hiss the cat, and does everything she can to kill the hag with kindness. And to the hag’s surprise, Daisy’s kindness actually gets to her in the end. I got a big kick out of this one. 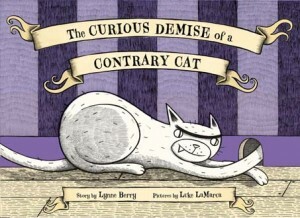 Blumenthal’s illustrations of the cat and the pink-haired, cotton candy-sweet Daisy made me laugh out loud. I can imagine that Daisy is truly the hag’s worst nightmare, and somehow turning the tables on the traditional Halloween scares with a sweet little girl is kind of perfect. And that Daisy is made out of perseverence. She is one resilient, unstoppable little ray of sunshine. This is a good one. Scaredy-Cat, Splat! by Rob Scotton (2010). I’m also a really big fan of Rob Scotton’s Splat books. The fuzzball cat has all kinds of adventures in cat school with his pet mouse Seymour. 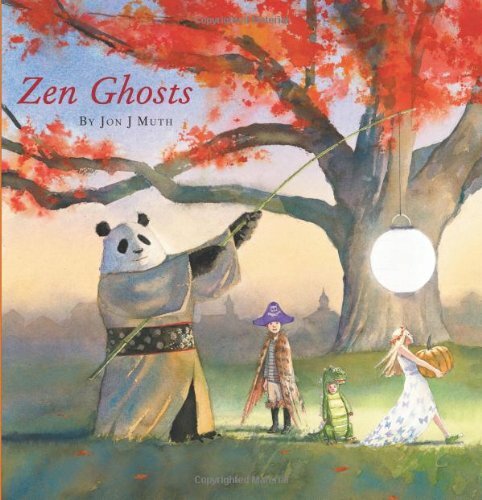 This is the 3rd of his holiday-themed books, and while I don’t love it as much as the original Splat, the Cat ( a regular in my rotation of 1st day of school books), this one is pretty charming. Splat wants to win the prize for scariest cat at school on Halloween. But try as he might, things don’t go as planned. His scary witch’s cat costume breaks, and when his mom fixes him up as a sock puppet spider the other cats just laugh. Kids will, too, since it’s hard not to laugh at Splat’s wide-eyed expressions. Even his jack o’lantern is just too silly and adorable to get scares. It isn’t until Mrs. Wimpydipple, his teacher, reads them a ghost story that Splat gets a chance to shine as the scariest cat in school. This is a fun one, reminding me a lot of the Spongebob Squarepants Halloween episode. And to me, that’s a big win. 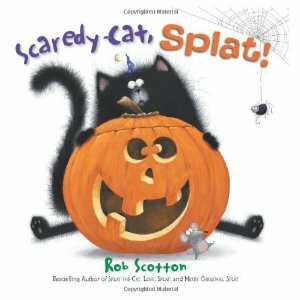 It’s a really goofy choice for younger kids on Halloween, and Scotton’s illustrations of Splat never cease to make me smile as big as he does.